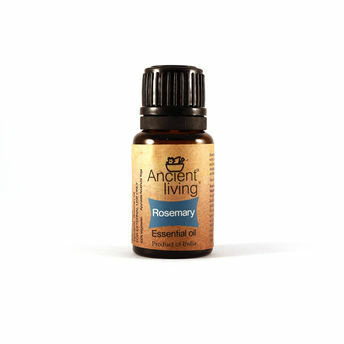 The Ancient Living Rosemary oil has a mesmerizing aroma which will help you refresh your mind and awaken your senses. When used in massages it helps in toning your skin and alleviating dryness. With its warm and penetrating aroma, it's one of the most stimulating oils used in aromatherapy. It has a very strong antiseptic action so is terrific to use in aromatherapy recipes for cleaning and relieving stiff and tired muscles. Rosemary has traditionally been used in skin and hair care for centuries. Analgesic, antiseptic, antidepressant, cephalic, diuretic, stimulant, tonic, astringent, hypertensive, emmenagogue, rubefacient. Pronounced action on the brain and the central nervous system, wonderful for clearing the mind and create mental awareness, while having excellent brain stimulant properties, helps in improving memory. In vapor therapy, it can be helpful for congestion, alcohol over-indulgence, overwork, sinusitis and mental and physical tiredness. Works well as a pain reliever without making you feel dopey. Can be used where there may be temporary loss of smell, or speech impairment. Relieves colds, catarrh sinusitis and even asthma when used as a steam inhalation. Helps to lower cholesterol levels in the blood and is good for your heart. Rosemary is astringent and toning and good for oily or congested skin, especially in the form of an aromatic water. A great oil for stimulating dull skin and good for the scalp, especially dandruff or loss of hair.